I'm spending the day editing my Paris book so thought I would share a little moment from when I was living in Paris and working on my guide. It's these little moments, so perfectly French, that I miss the most. 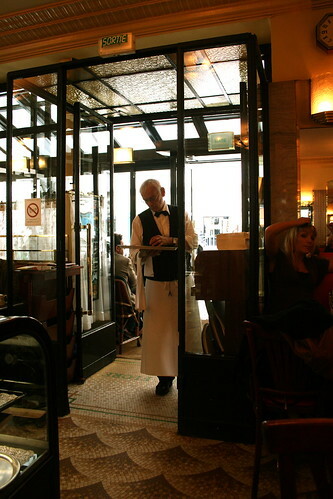 So join me for Sunday lunch upstairs at Café Flore, my favourite writing spot in all of Paris. I find my brother upstairs at Café Flore. It is freezing outside and I unpeel my layers before sitting beside him. The waiter in a black vest and bow tie drops off a tray with my brother's café crème and a small glass of ice water. He tells me he'll be back in five minutes to take my order. I spread out my papers, set my laptop beside my brother's and get to work. The room is almost empty, but after working with my head down for five minutes, I look up and notice the room is half full. The waiter returns, looking flustered, and takes my order. I order a salade verte avec tomates, since the nicoise is nearly 20 euros, and my brother orders his favorite baked eggs over ham. As our food arrives the room fills with people. A man with salt and pepper hair and a light blue cashmere sweater sits across from us. His small dog sits comfortably on a ledge above him. As I dig into my big green salad and soak up the perfect vinaigrette with a crunchy baguette, a woman sits down to join him. She is extremely petite and has her wavy hair thrown loosely, but immaculately, into a clip. She is dressed in a black dress with a long dangling necklace that sparkles in the light. Setting her Louis Vuitton bag down beside her, she pulls out a new purchase, dark green gloves laced with jewels around the wrists. She is an older woman, but so well groomed I could never guess how old. Her red lipstick is perfectly in place and when the waiters come by she shows them her newly manicured hands painted in a deep, velvety read. I can't decide whether she is wonderful or completely over the top. 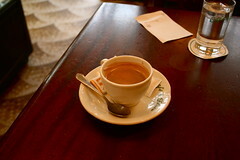 When their café crèmes arrive the small dog sits at a seat across from them and sets his small paws up on the table. I wonder if I'm dreaming. There are moments in Paris when I wonder if everyone around me is a paid actor. Like the woman sitting across from us, it can be a little over the top, but that's also what makes it so wonderful.